Use the following links to find out more about how you can improve the sustainability of your laboratory or other high-performance facility, or to find a job opportunity in this field. An international membership organization of engineers whose mission is to advance the arts and sciences of heating, ventilation, air conditioning and refrigeration for the public's benefit through continuous research and outreach. A national organization dedicated to advancing the use of solar energy throughout the U.S.
A national trade association representing members of the wind industry. AWEA provides information on wind energy projects worldwide, as well as new technologies and policy developments related to wind energy. Provides leading-edge resources for facilities planners and managers through its conferences, website, and publications. An organization that promotes buildings that are environmentally responsible, profitable, and healthy places to live and work. A website developed by the U.S. Department of Energy's (DOE) National Renewable Energy Laboratory and Cornell University to help campus-based institutions develop clean energy and carbon-reduction strategies. Architects and engineers can benefit from the enhanced energy modeling software, EnergyPlus, by DOE, which quickly calculates heating, cooling, ventilation, and lighting energy requirements. Download is free of charge. ENERGY STAR is a joint voluntary labeling program of EPA and DOE designed to identify and promote energy-efficient products to reduce greenhouse gas emissions. Read about products for both your home and business. EPA is working to reduce the environmental impact of its facilities and operations, from building new, environmentally sustainable structures to improving the energy efficiency of older buildings. GSA is committed to incorporating principles of sustainable design and energy efficiency into all of its building projects. GPC is a publicly available web site that provides a comprehensive resource for green purchasing requirements for the federal acquisition workforce. Learn sustainability strategies and compare materials for laboratory systems on the Sustainable Facilities Tool. FEMP works with key individuals to accomplish energy change within organizations by bringing expertise from all levels of project and policy implementation to enable Federal agencies to meet energy-related goals and provide energy leadership to the country. 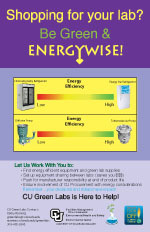 WaterSense is a partnership program sponsored by EPA to save water by labeling water-efficient products. Learn about WaterSense products, how to save water, and how businesses and organizations can partner with WaterSense. The CU Green Labs Program at the University of Colorado Boulder takes a collaborative approach to minimizing the use of energy, water, and material goods in the university's laboratories, all without compromising research integrity or safety. 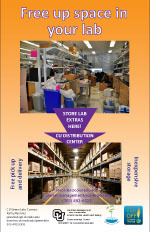 To promote resource efficiency in laboratories throughout campus, the CU Green Labs Program developed posters offering tips on creating and maintaining sustainable laboratories. 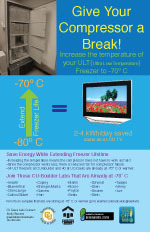 Visit the CU Green Labs website to access these posters, which can be customized using Adobe Illustrator to include your organization's information and displayed in your laboratory space. Note: These posters are intended to be used to promote laboratory sustainability and should not be sold for profit. Green Seal is an independent, nonprofit organization promoting the manufacture and sale of environmentally responsible consumer products. OSCAR will be an interactive technical resource that establishes a clear process to make the decisions necessary for the sustainable understanding and treatment of historic buildings. USGBC is working to promote buildings that are environmentally responsible, profitable, and healthy places to live and work. The WBDG provides government and industry professionals with information on building-related guidance, criteria, and technology from a 'whole buildings' perspective. This growing Web community is dedicated to wind energy. It aims to be a venue for collaboration, interaction, networking, and promotion. Interested in a career in architecture? Check out these job listings on the Association of Collegiate Schools of Architecture website. You can also follow I2SL on LinkedIn to stay connected and learn more about job opportunities. Tell us if you have a job opportunity that you would like us to share.